A small contingent of chunky, dove-like birds cautiously patter around a clearing in a park in suburban Sydney. Suddenly, a feral cat pounces out from some nearby brush, narrowly missing a flock member’s feather plume-festooned head with a paw. In a panicked huff, the birds take flight, and the air fills with a series of creaking whistles. Amazingly, these noises don’t come from the birds’ mouths, but from the flapping of their wings. The birds—crested pigeons (Ocyphaps lophotes)—have long been recognized for their loud flying, but new research has revealed how they make the whistling and just what these strange sounds are for: the whistling wings function as an alarm, telling other pigeons that danger is near and to vamoose, and it’s unlike anything known among birds. Crested pigeons are found throughout much of mainland Australia in open habitats. They’re known for both the stratospheric spire of feathers atop their heads, and the cyclical, metallic whistling noise their wings make when flapping—a distinctive enough trait that the birds are also sometimes called “whistle-winged pigeons.” For those unfamiliar, this is what it sounds like when doves fly. The sound effect makes for quite the dramatic exit, but until now, science didn’t know if the whistling had a specific function or if it was just a quirky byproduct of flight physics. If the whistling evolved to actually do something, what would that even be? Distracting predators? Startling them? Or was it a type of non-vocal communication directed towards other crested pigeons? That latter potential explanation had been floated out by Charles Darwin himself 150 years ago as a hypothetical feature of bird social life ripe for investigation. This “instrumental music” as he called it is an idea that has received barely any attention compared to birds’ conspicuous and important vocal signals. Biologists have been using bird vocalizations to help us understand everything from evolutionary processes to animal communication and cognition, but whatever role non-vocal communication plays has been difficult to demonstrate. The situation is a bit like attributing a great deal of a band’s success to the lead vocalist while ignoring the bassist….except in this case, no one really knows if the bassist even exists. The research team behind the study—centered at Australian National University—thought it was possible that the whistling flight of the crested pigeon could be one of these elusive, non-vocal “instruments,” potentially used as an alarm signal for other flock members. The team set out to systematically test this “wing whistle alarm” idea, and their results were published today in the journal Current Biology. If the whistling had evolved as a signal, there would likely be a specific, physical adaptation consistently responsible for producing the noise. 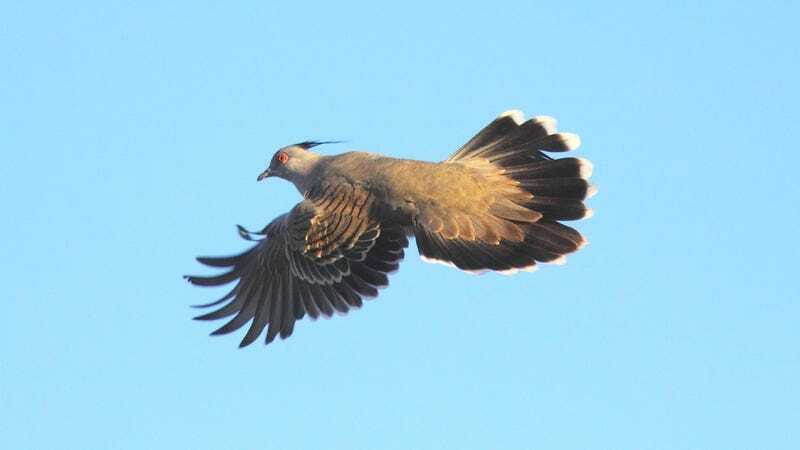 The researchers started looking for this device by taking high-speed video of crested pigeons taking flight, and pairing the footage with acoustic recordings. They found that the noise oscillated between a high note in the wing’s downstroke, and a low note during the upstroke. Taking a closer look at the pigeons’ wings, the researchers found that one flight feather in particular was a bit...off. In crested pigeons, the eighth primary flight feather out from the shoulder is suspiciously narrow, roughly half the width of the feathers on either side of it. To see if this funky “P8” feather was the source of the whistling, the team ran feather removal experiments, seeing how the whistling was impacted by removing the P8 and adjacent feathers. Birds without their weird little P8 feathers made whistles that had completely different high notes, suggesting that the modified feather, perhaps in combination with the feathers surrounding it, was the noisy culprit. But does the whistling happen automatically with every wingbeat? An alarm is only useful if it adequately communicates that something is wrong. To test this, the researchers examined the whistling under different types of flight: normal, casual flight, and “escape” flight caused by a simulated threat. Escape flights, understandably, had faster wingbeats and created high-tempo whistling to match, showing that escaping birds sound different than relaxed birds, and that the “alarm” intensity matches the severity of the threat. Finally, the researchers tested if other pigeons actually respond to the alarm. They employed a playback experiment, exposing crested pigeons to recordings of escape flights made by pigeons with their P8 feathers intact or removed. The crested pigeons were much more likely to initiate their own frantic escape flight if the playback was from a pigeon that still had their P8 feathers. When pigeons heard the whistling of a P8-less pigeon, they mostly just sat there. This was the final piece of the puzzle, solidifying the importance of that narrow P8 feather in communicating danger, and showing that the other birds react to the alarm signal. This strange, built-in alarm system is remarkable for a couple of reasons. For one, it’s incredibly reliable. Unlike with many vocal alarms, the wing whistling is hard to fake or misfire because the whistling is only produced when the pigeon is fleeing danger. The alarm signal is also a truly unique form of non-vocal communication in birds. Some birds can make sounds with their wings and bodies—like manakins, which can buzz their feathers during courtship displays—but the crested pigeon’s alarm system is a rare confirmation of both the production and the response to the signal, showing a true instance of non-vocal communication. Since noisy wings are found in many other groups of birds, it’s quite possible that many more of our already musically talented feathered friends are hiding some serious instrumental skillz.